Over the last 10+ years of being an exhibited and commissioned artist I have learned a lot of do’s and don’ts of showing art. If nothing else I would like to give some insight into the experiences I have had and what I have learned from them. Does an art gallery sell pop art? Do you make pop art? If those answers do not match up, you might not get on the galleries radar. 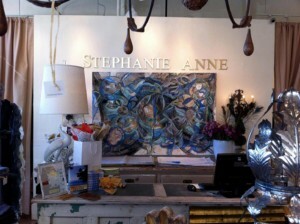 The juxtoposition of my artwork with these “high value” items at Stephanie Anne boutique helped to sell my artwork. Does the gallery take a commission on sales? Do they charge any kind of fees? Knowing how money is involved with these businesses in relation to the artist makes all the difference in the world. 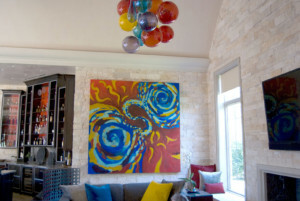 Typically a gallery will take 40%-50% of the sales of any art sold or commissioned. Anything more than that is veering towards unethical business practice. If they charge a submission fee of around $20 to submit to a juried show, that’s fairly normal. If a gallery charges a monthly fee for wall space or “exposure” you should turn in the opposite direction and run. I once spoke with a gallery in Miami that wanted to charge upwards of $3,000.00 for three months of wall space. This is a total scam. That being said, always be polite and decline these offers gracefully. You never know when your actions may come back to you in the future. I have learned a lot from volunteering at art museums and galleries. Knowing how people behave in these settings will tell you a lot about what kind of fit there is with an organization. Trust your intuition. If you feel something about the organization is not to your liking listen to that intuition. You are developing a long-term business relationship and it is extremely important that you enter into a healthy and mutually beneficial working relationship. If anything about the situation seems lacking or less than positive, you might want to consider looking to greener pastures. I sold this commission through Hayslip Design and Associates. This was my third (and largest) painting sold to this client. Unless a gallery or representative tells you otherwise, you are going to have to do your own promotion. Don’t get me wrong: these organizations are motivated to sell your work. However, you will always have to be your own best advocate. End of story. Part of mapping out your goals involves learning the difference between the right and wrong contexts to place your work. I’ve had shows in places that looked cool and brought in a good crowd, but were not right for the kind of goals I wanted to achieve. It’s much better for a creative individual to submit work to reputable publications, juried exhibitions, city public arts departments, etc. rather than places like vanity galleries. Just because your art is being “shown” doesn’t mean you are not actually doing harm to your own career. Being armed with knowledge of what the difference between those contexts is a major part of building a successful practice for your art business. Unfortunately, not everyone that works in the Art business is honest or reputable. Work with people who have your best interest in mind because that will ultimately benefit them in the long run. An art dealer can always turn around and turn out your art for 2-5 times the price you sold your art for. Don’t fall prey to a mindset of desperation. Know the real market value of your art and put yourself out there in the right places. Don’t be afraid to go big or go home… sometimes. Always have a plan B. Create opportunities for yourself when your art business is slow. Learn how to effectively negotiate a commission or a sale. If you have questions I can answer them. Gallery owners and representatives are busy people. I have been on both sides of the coin. Learn as much as you can about a galleries submission process. If you can’t send a short friendly e-mail. In many cases it’s not a good idea to cold call a gallery asking them to look at your portfolio. You can try to inquire about a submission process, but don’t be too aggressive about it. This applies to almost any kind of job submission these days. There’s an art to following up. Learn about it, and keep in mind you are building a relationship. The gallery owner or curator is a human, not a number. Once you have gone through the submission process. Follow up via e-mail and via phone, but not too much. Knowing appropriate professional etiquette makes a huge difference, and will always be appreciated by the right people.